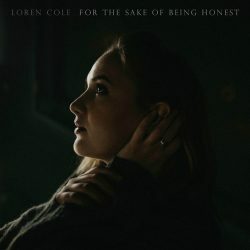 Loren Cole is a young artist base d in Los Angeles, California and the sunshine from that State exudes from this album from the start of the very first track. Echoing the style and vibe of Fleetwood Mac Cole has written ten songs of great maturity and positivity without straying into the formulaic mainstream dross leaving us with a superb debut. The opener ‘God Only Knows Why’ is an uplifting ditty which has traces of the ’60’s flower power about it but with more depth and intelligence. ‘Follow’ could be lifted from many pop songbooks of years past with a catchy hook and a horn section to boot. There is a tender love song in ‘Brand New’ which has hints of teenage innocence but is written from the perspective of experience and the album closer ‘What Are We Doing Here’ is suitably reflective rounding off a thoroughly satisfying listen. There is precious little information available about Cole out there at present but this is a situation that is unlikely to continue if she continues to produce work of such high standard – a great record which is just perfect for the time of year. Previous Previous post: Chuck Prophet and Stephanie Finch tour UK in September.